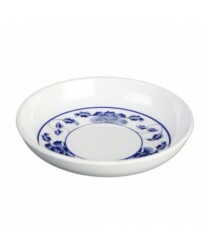 Featuring a classic blue floral design, the Thunder Group 1101TB Lotus Sauce Dish 2-3/4" will add a touch of authenticity to your Asian-style restaurant. This round sauce dish has the look of fine ceramic, but its melamine construction makes it far more resistant to chipping and breakage. A pleasure to work with, this pretty 1-ounce sauce bowl is lightweight, sturdy and safe for use with a dishwasher. Use it to present your signature sauces, dips and condiments, and note how it contributes to your decor.